When an HD-SDI output device is configured, the HD-SDI output of that device always shows the same image as the image viewer. You can set the image viewer to fullscreen on the screen where the viewer is currently shown by clicking the green little icon in the window header bar, or click “Fullscreen” in LiveGrade Pro’s toolbar. In a setup with two computer screens attached to your Mac (or a notebook screen with an additional external monitor) the viewer can go fullscreen on one computer screen, while the LiveGrade Pro main window is be shown on the other screen. To do so, move the image viewer window to the second screen and then go to fullscreen. The image viewer can display a second image or look (e.g. from a frame grab of a shot) for reference in a split-screen or overlay mode. 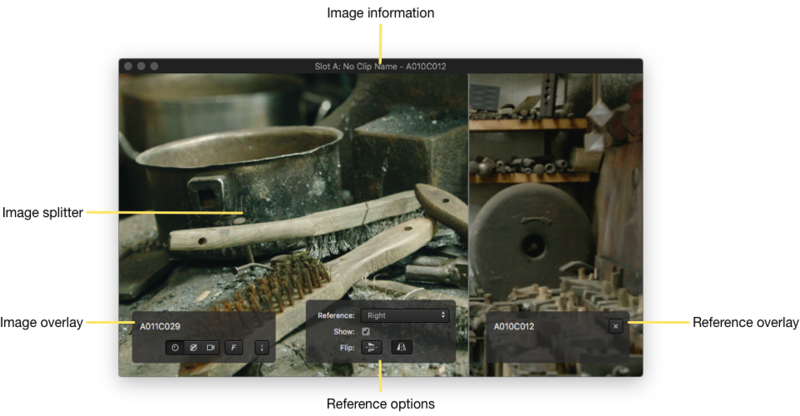 The image overlay displays the display options for switching between “Graded”, “Bypass”, and “Original” image. These controls double the controls from the slot user interface. The image overlay also offers a “Export image” button. This button saves the current image in the file system of your Mac. This control doubles the control from the slot user interface. The reference overlay shows the name of the image shown for reference, and allows to remove the reference. In the reference options you can choose which compositing mode should be used for displaying the reference image with the viewers image. Left – Right: Side-by-side with movable image splitter, viewer image is left, reference image is on the right. Overlay: Reference image is composited over the viewer image with variable opacity. You can move the image splitter (e.g. shown in “Left – Right” mode) by dragging it. The header of the image viewer displays the current slot name, the name of the image and the name of the reference image.